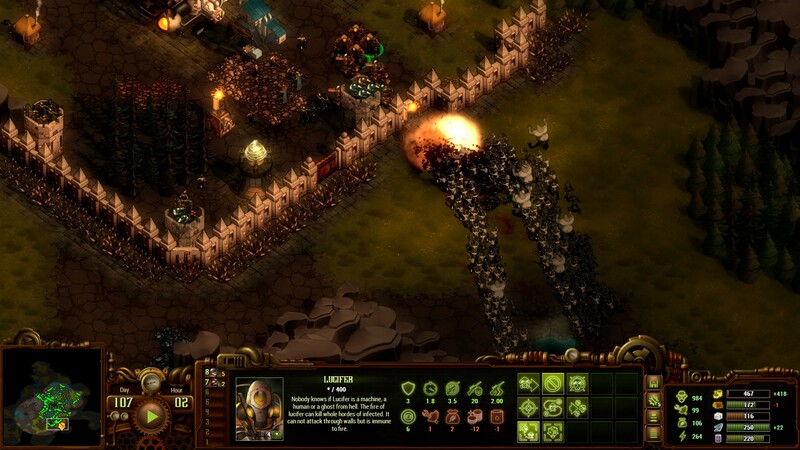 Early Access arrival They Are Billions Steam page describes the game with tags like ‘survival’, ‘strategy’ and ‘base building’ and while these are certainly aspects of the gameplay my first impressions of it remind me more of a mix between RTS (real time strategy) and tower defence. As a long time RTS fan the initial moments feel very familiar. Locating resources, creating basic buildings, managing population and setting up basic defences. By mid game you are certainly base building with solid walls, advanced defences and armies but the lead up to that is more a hodgepodge of trying to become efficient and defending the small hordes that attack you, often with many automated towers. In fact there’s a lot of automation going on and it seems to me developers Numatian Games are trying to focus the player more on the combat and less on the minor details of being the best possible base you can. For example, when a you place a building it is auto-built (as long as you have available population) and if placed next to a resource that resource is auto-collected. Some resources are collected over time and some are auto-generated as soon as you place a specific building. Towers also auto-attack enemies within their available range. This isn’t a bad thing though as on higher difficulties things can become quite hectic and this allows you to focus on enemy encounters and how best to tighten up your defences before the next wave hits. There’s no tutorial in They Are Billions as of yet so I found enjoyment in my initial game discovering how everything worked and pieced together with each other. During my second playthrough I was disappointed to notice that I had completely explored the depth of the games base building and unit creation the first time around. It seems that at this stage of Early Access there isn’t a whole lot of depth to the game, but maybe that’s just my mind subconsciously comparing to other RTS games as the gameplay feels quite similar at times. There are no multiple development trees, no factions with alternate technology and no unique units. Everything felt the same from one game to the next apart from the difficulty which I increased after my first game. Explore the map, collect resources, expand, defend, attack, repeat. I think They Are Billions would really benefit from a bit of tactical depth, but who knows what is to be added in the future of this games Early Access phase. I feel like I’m being unfairly critical as They Are Billions is a good game at heart. If you are used to the RTS genre then getting into this game will be fairly straightforward. You start with a fairly small area of available land on which to build, but can expand this area over time. Expanding too far to fast can leave you open to attack, but not expanding quick enough can leave you lacking on resources and stunt your recovery in between defending waves of zombie hordes. Building placement is key to success mostly because there is not a lot of time to recover on the hardest difficulties and having to rebuild and use resources which should be spend on units will most likely mean you get overwhelmed the next time around. This can be somewhat averted by using some smart tactics like funnelling the undead waves down a walled off corridor lined with turrets. As this is essentially a game about managing units and resources it seems to be missing key management fine tuning like selecting idol units or keyboard shortcuts to make things easier. Of course you can pause the game to sort these things out too. Units also get stuck on each other quite easily which is frustrating at times. I get an overall good feeling about They Are Billions and enjoyed my time with the game but as this is early in EA there is still much that can be improved upon at least in my mind.